When I first told my housemate I was making this salad, she was sceptical. It’s not that she doesn’t like kale, in fact she’s a die-hard kale salad fan, but she found the parsnip aspect not so appealing. 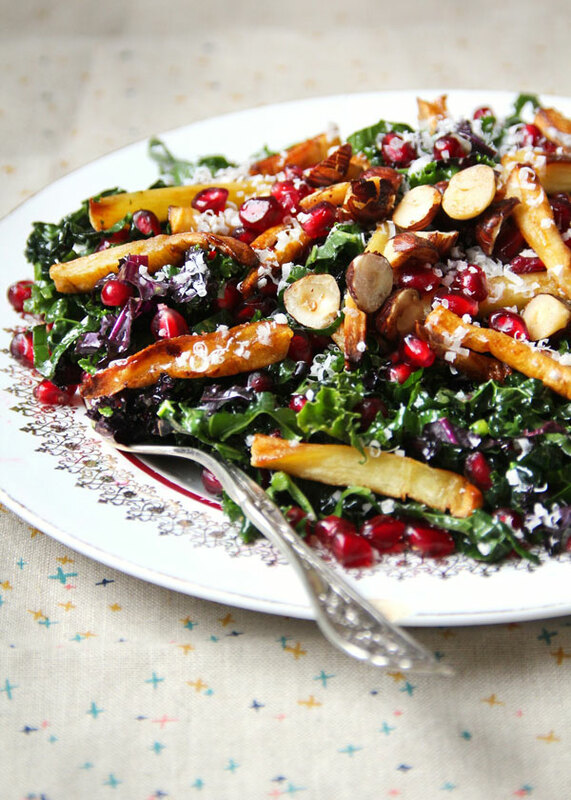 But I was pleased to see she changed her mind the minute she tasted that crispy maple-caramelized roasted parsnip intermingled with sweet pomegranate seeds and shredded kale. I hope you’ll give this one a try as well. I have yet to meet someone who doesn’t love this salad. This is an antioxidant-packed winter salad that brings together the colors of the holidays and delivers a sweet maple-infused flavour punch. I always make sure I have lots of holiday salad recipes up my sleeve for the month of December because this time of year can be so filled with rich, heavy foods (which, don’t get me wrong, have their full place of honour at my table). But having lots of salads keeps everyone glowing and happy. What are your favorite holiday salad recipes? Please share in the comments below. 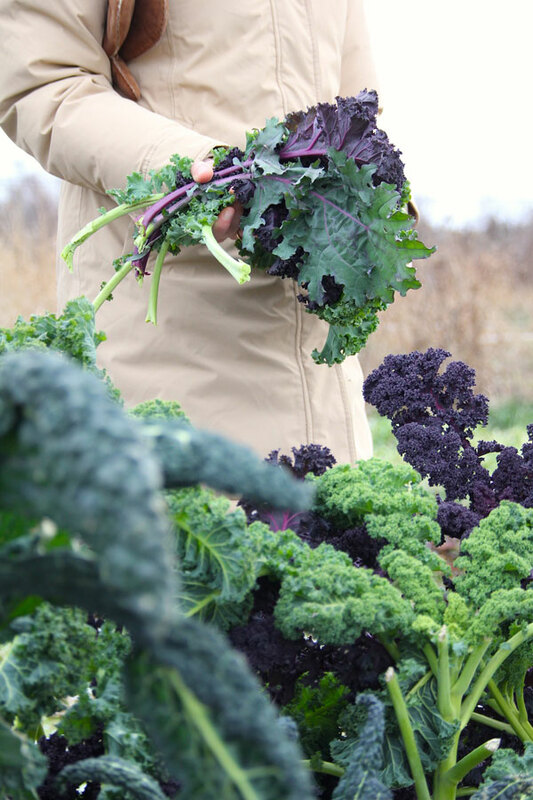 Kale is usually the last soldier standing in the garden and even way up here in the snowy north, we can often harvest it into mid-January. So kale makes an almost daily appearance on our table and I never seem to get tired of it. You may remember this kale Caesar salad from the summer, as well as my “massaged kale” salad from a couple years ago. 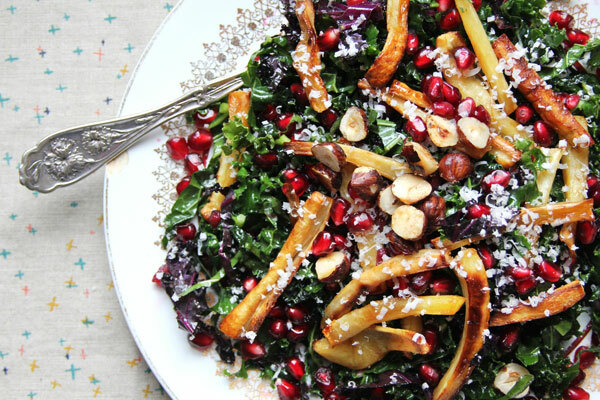 This particular version of kale salad combines raw shredded kale, sweet maple caramelized roasted parsnips, and juicy red pomegranate seeds. I like to toss it with a simple lemon maple vinaigrette and if I have time to get fancy, garnish it with some parmesan shavings and toasted hazelnuts. But you could easily personalize it and add bacon, or roasted squash or brussels sprouts, or shredded red cabbage for additional color. Make it your own! PS: If you’ve never seeded a pomegranate, don’t be intimidated, this video provides a great tutorial on how to do it! I hope you’ll give it a try and enjoy it! Bon appétit! 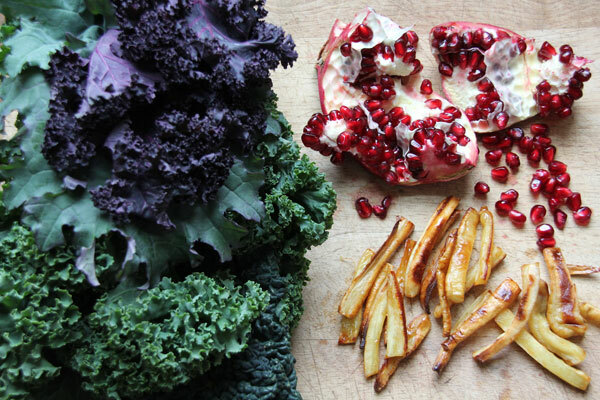 Prepare a crispy maple-caramelized, roasted parsnips intermingled with sweet pomegranate seeds and shredded kale from Aube Giroux of the Kitchen Vignettes blog. If you wish, garnish with toasted hazelnuts (simply place hazelnuts in a skillet on medium heat for about 5 minutes, stirring frequently so they don't burn) and freshly grated parmesan.